[prMac.com] Knegsel, Netherlands - Design Luscinia, an independent mobile software development company, is very pleased to announce the release and immediate availability of Word Dance 1.0, their new word cloud generator developed exclusively for iPhone, iPad, and iPod touch devices. Featuring a sophisticated layout engine, Word Dance allows anyone to create videos of word clouds that morph between shapes. The app draws upon already established elements from previous Design Luscinia apps for an innovative experience in video effects. "Word Dance is the culmination of language, creative design, and videography in one consolidated app," said Jack Goossen, founder and owner of Design Luscinia. "The resulting word clouds are highly mesmerizing and captivating, making them perfect for presentations, video introductions and intermissions. Designed with adolescents and teenagers in mind, Word Dance will help them to create that unique professional effect with minimal effort." Word Dance's finished word clouds can be used as stand alone animations or also incorporated into presentations and productions. The app uses the same word cloud layout engine as Design Luscinia's previous creation Phoetic and is able to generate detailed word clouds in any shape. Additionally, Word Dance is compatible with Fonteer, allowing users to select their favorite fonts when designing a word cloud. "Our passion is creative app development, and we want mobile users to have access to a rich set of tools," said Goossen. 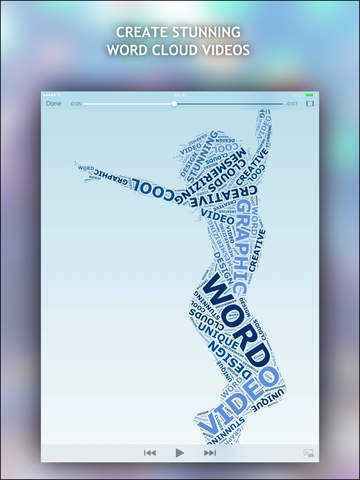 "Word Dance is a perfect app for combining our previous experiences into a fun product. We are incredibly excited to officially launch the app today, and are encouraging everyone to add a little digital excitement to their daily lives." Word Dance 1.0 is $2.99 USD (or equivalent amount in other currencies) and available worldwide exclusively through the App Store in the Photo & Video category. There are no add-ins, in-app purchases or additional costs. Please contact Jack Goossen for more information or visit Design Luscinia online. Promo codes are available to members of the press. Design Luscinia is a Dutch mobile software development company founded in 2012 by Jack Goossen. The company provides quality apps for content creation on iPhone, iPad, and iPod touch. Design Luscinia is best known for 'Phoetic - The Amazing Photo Word Cloud Generator'. Copyright (C) 2012-2016 Design Luscinia. All Rights Reserved. Apple, the Apple logo, iPhone, iPad and iPod are registered trademarks of Apple Inc. in the U.S. and/or other countries.